The legendary Iwata Custom Micron is quite possibly the best airbrush on the market, but it is more demanding to use than others. 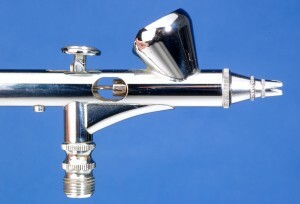 The airbrush in its various manifestations has been used by modellers for half a century and a wide range of manufacturers have made their contributions to the cause. 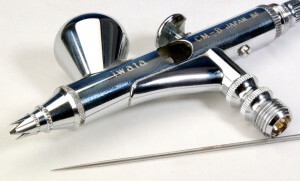 At the top of the evolutionary tree sits Iwata, a company who have taken the manufacture of airbrushes to an almost Zen-like level of artistry. 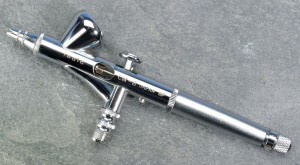 On the face of it, their airbrushes look much like many others, but from the moment you hold one in your hand and test the controls, you know it’s a quality item. We tested the Custom Micron B with the paints normally used in TMMI; Tamiya Acrylics, Vallejo Model Air, Alclad II lacquer and Humbrol Enamel. Considering that it is designed for graphic artists and illustrators who would normally only use inks and very lightly pigmented materials, the Custom Micron B copes admirably with modelling paints, which are generally pigment-heavy. The reward for your investment will be incredibly fine paint-atomisation and potentially very fine lines, plus the pleasure of using one of the most finely engineered pieces of equipment available to the modeller.